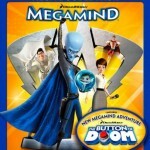 DreamWorks’ Megamind will release on Blu-ray Disc and DVD on Feb. 25, 2011. And, for a limited time the Blu-ray/DVD Combo and DVD Double Pack editions will feature a new animated adventure titled Megamind: The Button of Doom. 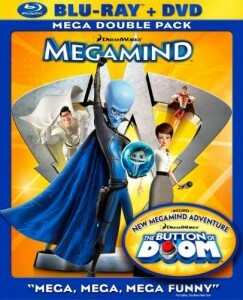 Megamind packaged disc editions include Blu-ray/DVD Combo, Double DVD Pack, Single-Disc Blu-ray and Single-Disc DVD. Voiceover talents in Megamind include Will Ferrell as Megamind, Brad Pitt as Metro Man, Tina Fey as Roxanne Ritchie, and Jonah Hill as Titan. In Megamind: The Button of Doom, some of the original voiceover talents return including Will Ferrell again as Megamind and David Cross as Minion. Extras on the discs include featurette “Meet the Cast of MEGAMIND,” a deleted scene, filmmaker’s commentary, previews, and “World of DreamWorks Animation” promotional. Extras on the Blu-ray Disc and DVD Double Pack include featurettes “Inside Megamind’s Lair,” “AnimatorMan,” and “You Can Draw Megamind” among other bonus content. The Blu-ray edition is formatted in 1080p high definition boasting 7.1 channel Dolby TrueHD for audio.